On the 22nd of June 1982 driver Kenneth Fell was returning to Longridge depot in Atkinson Borderer 4x2 tractor unit Reg No OTF 550M Fleet No 81 'Robust' hauling a partially loaded 40 foot tandem axle trailer with waste chemicals in 40 gallon drums on board. On the A59 at Copster Green, just before the left hand bend approaching the Park Gate Hotel, a Toyota car travelling in the opposite direction overtook another vehicle and hit OTF 550M head on. 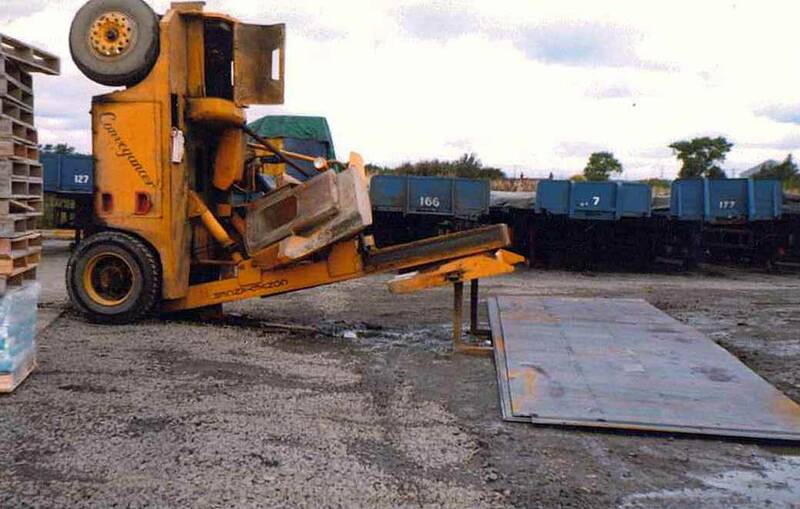 During the collision the front offside axle of OTF 550M was wiped out causing the vehicle to veer across the road resulting in around ten drums of the waste chemical's dropping off the trailer. Driver Kenneth Fell, who was in no way to blame for the accident, was not hurt although he was badly shaken up. Unfortunately, as a result of the accident, the driver of the Toyota car was killed. 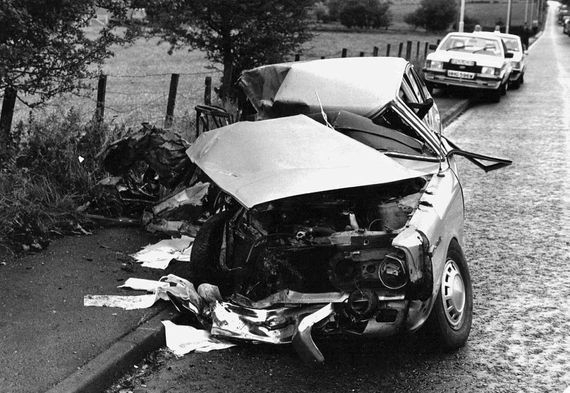 The seriously damaged Toyota car in which the driver died after it hit Atkinson Borderer 4x2 tractor unit Reg No OTF 550M head on while attempting an overtaking manoeuvre on the A59 Longsight Road at Copster Green Lancashire. 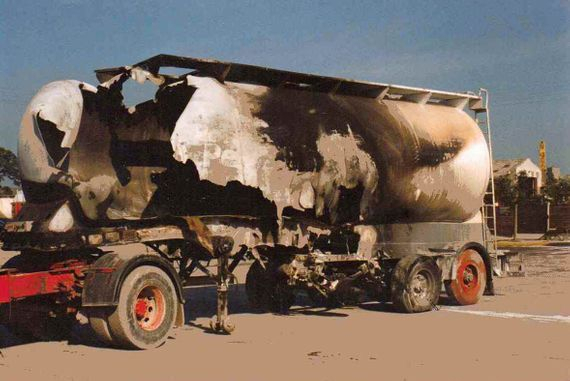 The partially loaded 40 foot tandem axle trailer had 40 gallon drums of waste chemicals on board, ten of which broke lose after the collision. Atkinson Borderer 4x2 tractor unit Reg No OTF 550M Fleet No 81 'Robust', powered by a Cummins NH250 engine, was registered new on the 1st of September 1973. After the accident above it was rebuilt and went on to serve Riding's for many more years until it was sold on to J. Canning of Leyland. 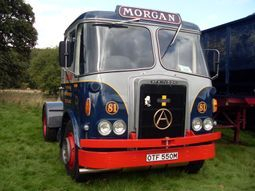 When J Canning ceased trading it later passed into the hands of Kevin Dennis and into preservation in Norfolk were it is now in the livery of Morgan Transport as can be seen in this photograph here. 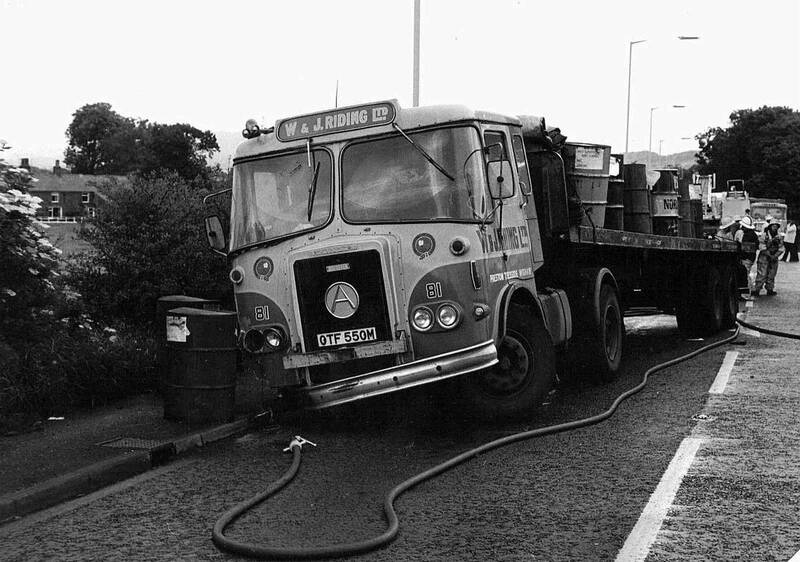 Seddon Atkinson 400 Series 4x2 tractor unit Reg No XFV 910V Fleet No 98 'Royal Star', powered by a Gardner 240 eight cylinder engine, came to grief just three miles from Longridge depot when the whole outfit turned over on a right hand bend on the B5269 at Whittingham. Hauling a 40 foot tandem axle trailer loaded with 20 tons of Coca Cola and Lilt it rolled over and finished on it's side in the adjoining field. After the accident this bend was always referred to by Riding's drivers as Coca Cola corner. 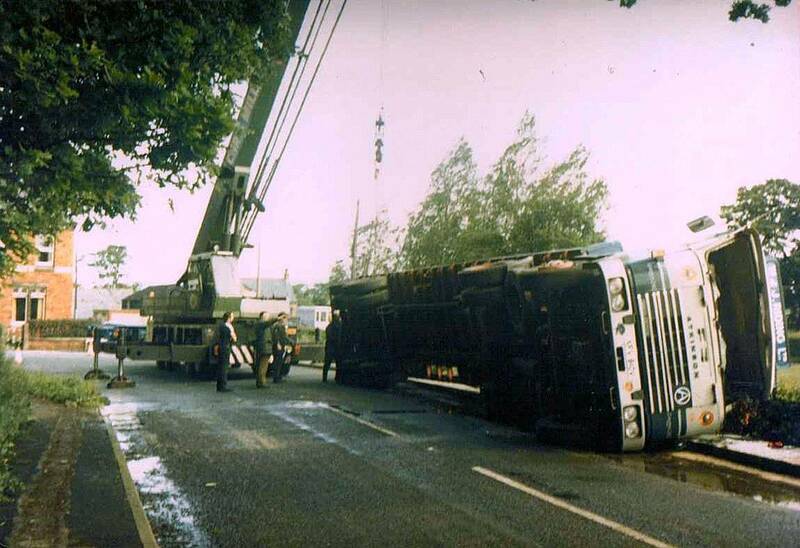 Seddon Atkinson 400 Series 4x2 tractor unit Reg No XFV 910V Fleet No 98 'Royal Star' lies on its side after losing its 20 ton load of Coca Cola and Lilt . 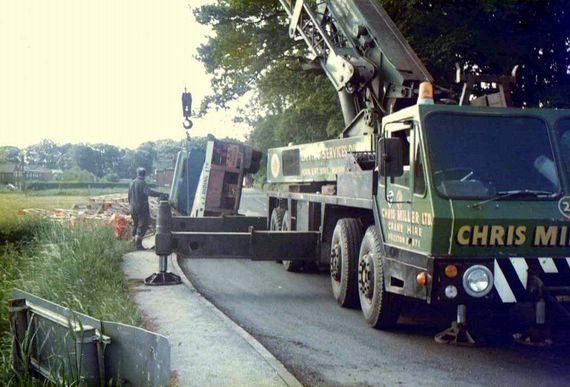 At the time of the incident Chris Miller of Preston provided the crane for recovery and Tom Riding can be seen in the picture directing operations. The crane operated, by Chris Miller of Preston, prepares to start the recovery operation and get the vehicle back on it's wheels. 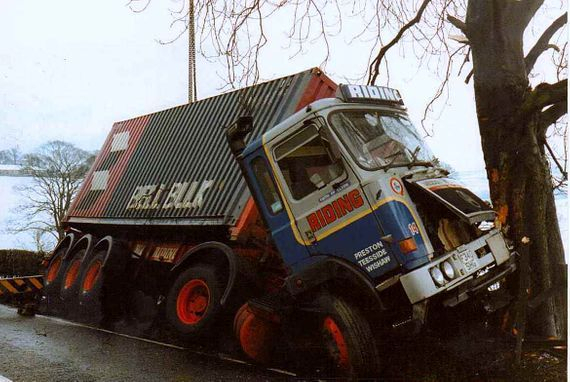 After being righted Seddon Atkinson 400 Series 4x2 tractor unit Reg No XFV 910V Fleet No 98 'Royal Star' was in a rather sorry state after suffering extensive cab damage in the accident. 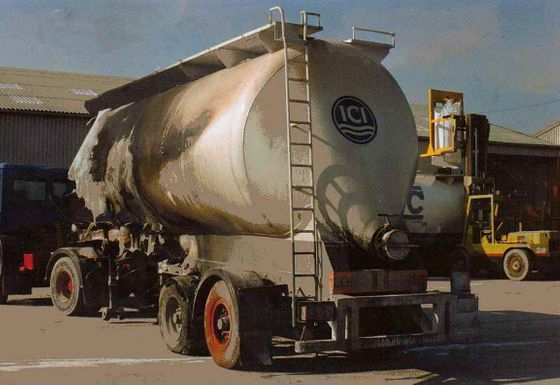 While travelling solo through the village of Grimsargh Seddon Atkinson 6x2 tractor unit Reg No KPF 421W ran into the back of a tanker operated by Fleet Haulage. Seddon Atkinson 400 Series 6x2 tractor unit Reg No KPF 421W Fleet No 50 'Alfred the Great' was powered by Cummins E290 engine. 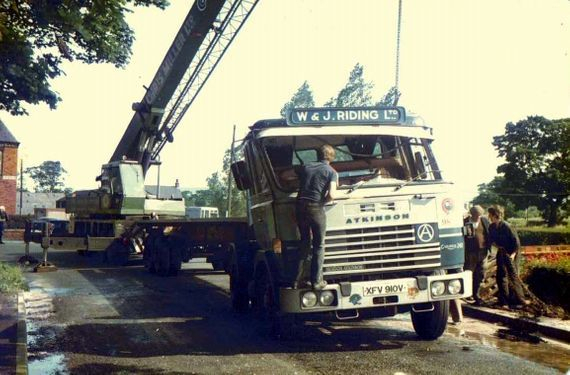 Registered new on the 1st of August 1980 it was bought second hand when three years old from Yardley of Kidderminster for £9,400 plus vat on the 7th of August 1983 and was fitted with Norde third axle conversion to run with a tandem axle tipping trailer at 38 tons. It came to grief in the wet when it ran into the rear of a Fleet Haulage tanker when travelling unit only at Grimsargh about 3 miles from the depot at Longridge. After the accident KPF 421W was rebuilt using the cab from Seddon Atkinson 400 Series Reg No UJP 758S Fleet No 79 'Hardwicke' which had been scrapped in June 1986. 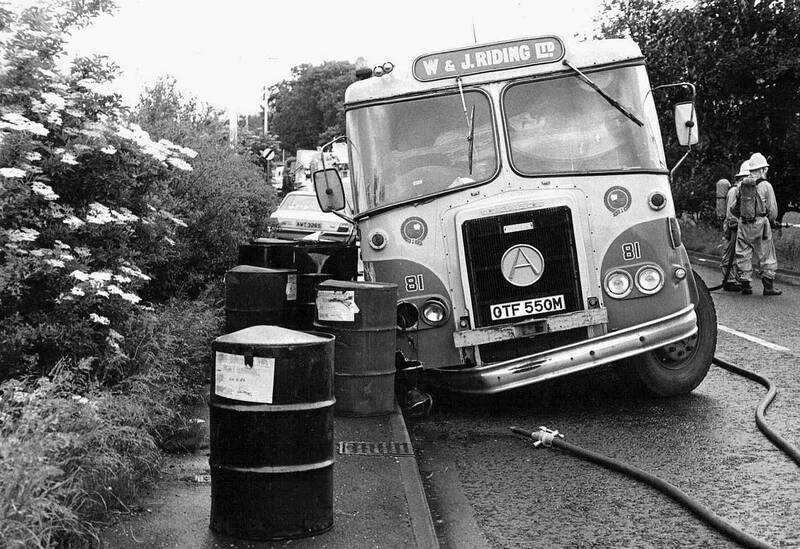 Another shot of Seddon Atkinson 400 Series 6x2 tractor unit Reg No KPF 421W Fleet No 50 'Alfred the Great' which came to grief in the wet when it ran into the rear of a Fleet Haulage tanker when travelling unit only through the village of Grimsargh Lancashire. Seddon Atkinson 4-11 Series 4x2 tractor unit Reg No F340 SHG left the road on the A59 just east of West Marten and hit a tree. 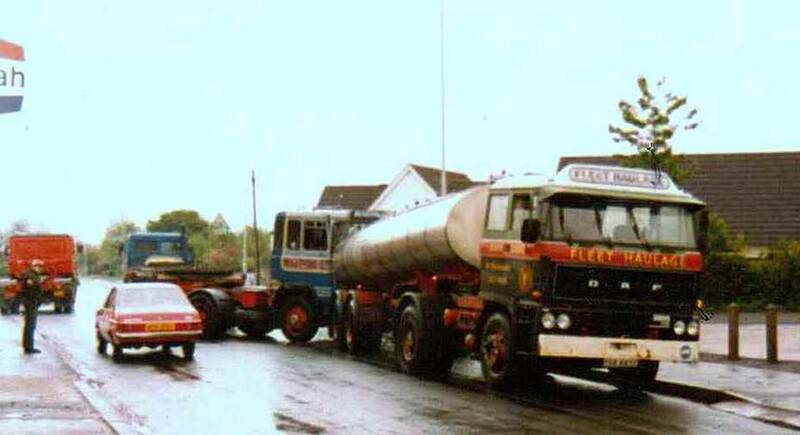 Seddon Atkinson 4-11 Series 4x2 tractor unit Reg No F340 SHG Fleet No 14 'Firth of Clyde'. Registered new on the 1st of September 1988 it came to the end of it's working life in 1995 after it left the road on the A59 just east of West Marten and hit a tree. 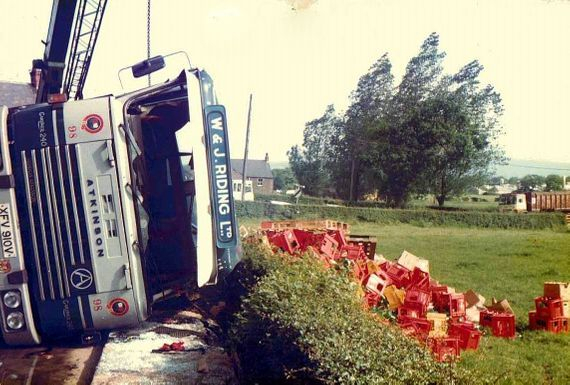 At the time of the accident it was hauling this Bell 30ft box loaded with 24 tons of Barley for Whitbread's at Samlesbury. 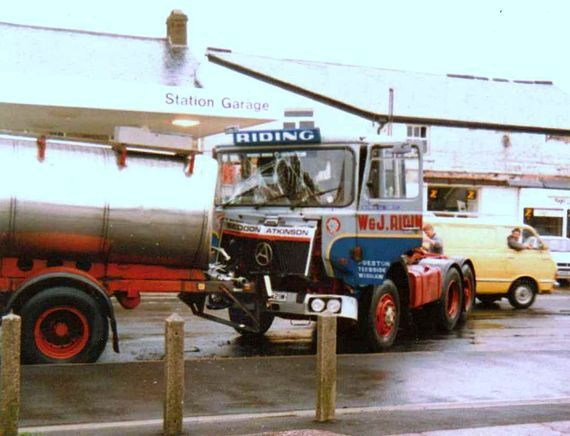 This particular tractor unit along with Reg No F110 SRN Fleet No 22 'Solway Firth' were both fitted with Gardner 6LXDT engines and were the very last Gardner engined vehicles to come out of the long gone Seddon Atkinson factory at Oldham in 1988. With the road closed a mobile crane arrived on site to assist in the recovery of Seddon Atkinson 4-11 Series 4x2 tractor unit Reg No F340 SHG. The vehicle came to the end of it's working life in 1995 and was written off after it left the road on the A59 just east of West Marten and hit a tree. It was hauling a 30ft Bell box loaded with 24 tons of Barley which can just be seen lying on it's side next to the tree in the adjacent field after being removed from the trailer by the crane. 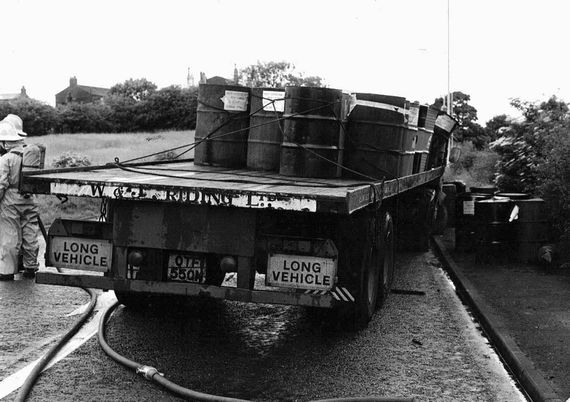 On the A66 near Penrith one of Riding's ICI tandem axle tankers loaded with twenty seven tons of PTA for Kodak Workington burst into flames. This was the end result after a tyre went soft, with the driver unaware he kept ploughing on causing the tyre to overheat and burst into flames. 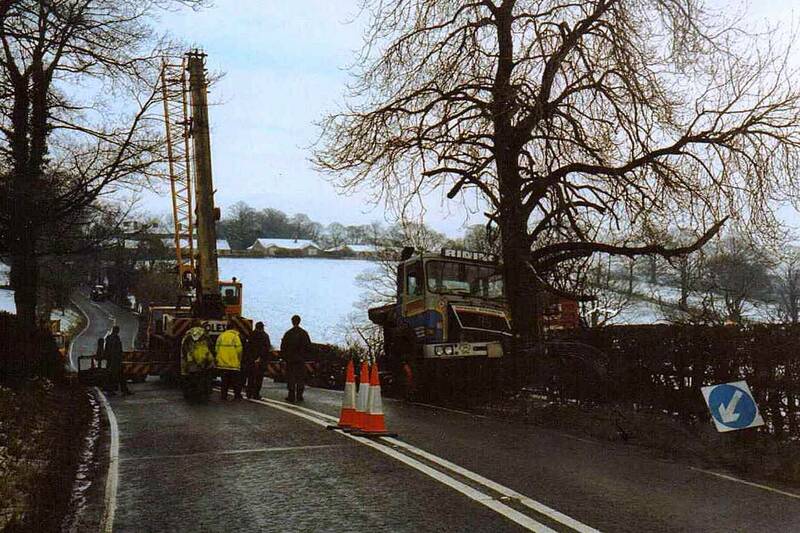 The incident occurred on the A66 near Penrith with the tanker loaded with twenty seven tons of PTA for Kodak Workington. Fortunately the tractor unit was disconnected and driven clear and did not suffer any damage. Another shot of Riding's burnt out tanker after it had been recovered and brought back to the depot ay Longridge. 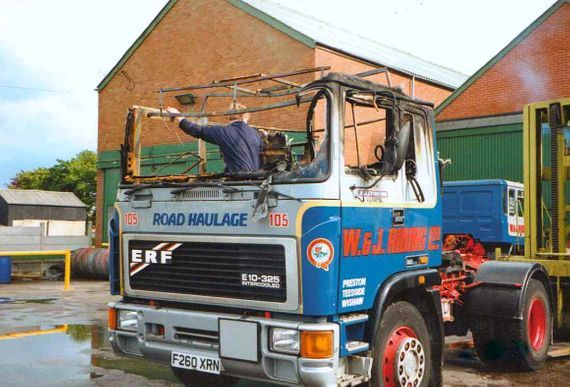 Seddon Atkinson Strato 4x2 tractor unit Reg No F500 BFV Fleet No 24 'Invincible' did not live up to it's name after being burnt out following a fire which started in a front wheel hub. Seddon Atkinson Strato 4x2 tractor unit Reg No F500 BFV Fleet No 24 'Invincible' was the first Strato tractor unit to enter service with Riding's on the 1st of May 1989 at a cost of £30.027.65p + VAT. 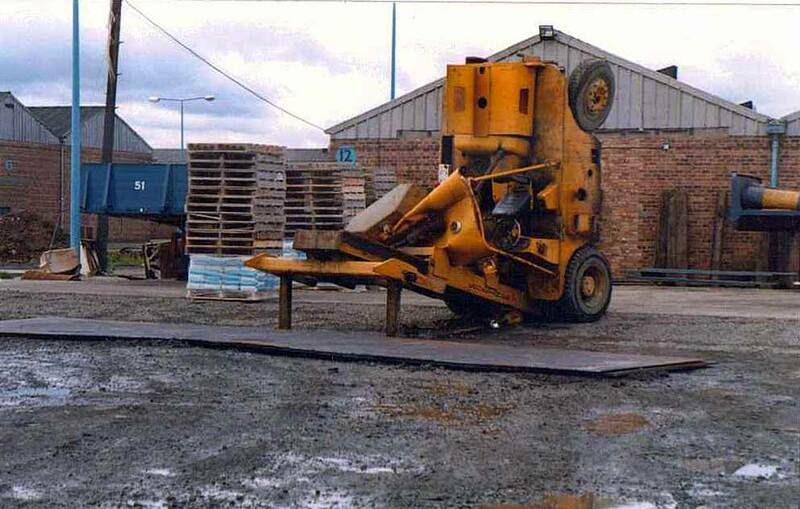 Unfortunately F500 BFV did not live up to it's name of 'Invincible' as it was written off after being burnt out following a fire which started in a front wheel hub. Another shot taken in the depot at Longridge shows the burnt out remains of Seddon Atkinson Strato 4x2 tractor unit Reg No F500 BFV. ERF E10 4x2 tractor unit Reg No F260 XRN Fleet No 105 'Ingleborough', powered by a Cummins L10 325 engine, was registered new on the 10th of February 1989. Driven from new by Vinny Chambers and based in Keighley this was the result of an electrical problem causing it to burst in to flames when just two years old in June 1991. As Tom Riding says "fibre glass cabs wont rust which is a good thing, but unfortunately if you get them hot enough they sure as hell will burn". 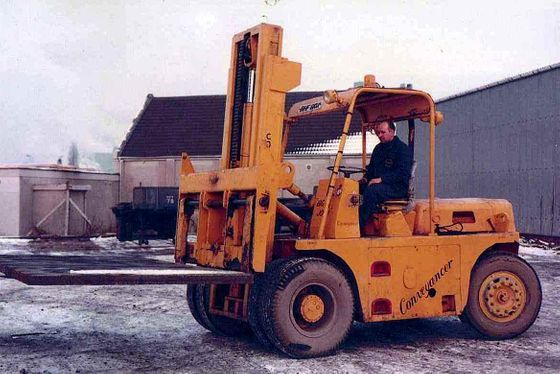 F260 was later fitted with a new cab and remained in service with Riding's for another six years until 1997. The late 'Big' John Elliot was the depot manager at W & J Riding's Motherwell depot. John was fantastic worker and used to turn the vehicles around in double quick time. Sometimes this haste had dire consequences especially, before the yard was concreted. In this series of pictures below the overloaded fork truck could not manage the weight and as can be seen below it finished up in a precarious position. 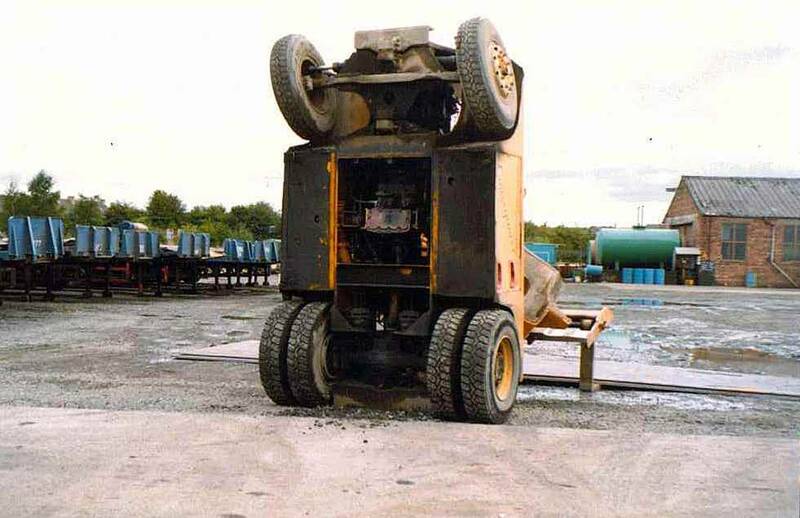 Luckily no one was hurt on this occasion.